Unicorns are a bit of a joke. Today, they are mainly associated with twee girly-girl types, and are generally not taken seriously. At best, they are used ironically (as in this advertisement, plastered all over NYC subways this past summer), or deployed by jaded hipsters as the subject matter of stupid tattoos. Sometimes, we couple them with other symbols like kittens, cupcakes, and rainbows and joke that they “poop glitter.” For most of my generation, they stand as a clichéd symbol of vapid femininity, naiveté, and general wide-eyed stupidity, even among the wide-eyed, naïve females among us. For this reason–as well as an ill-founded prejudice against whatever artworks tend to be the most popular at a given museum–I have never given the Unicorn Tapestries at the Cloisters much thought. On a recent trip to this museum, however, I was very much struck with these tapestries, and it got me wondering why I had never paid them much attention before. In many ways, they are exactly the sort of thing I am usually drawn to: they are from a time period that fascinates me; their colours are muted and imagery floral; their craftsmanship is exquisite; they are rife with allegory. But the Met puts them on t-shirts and refrigerator magnets à la Mona Lisa, and unicorns have become clichéd, so I had never really studied them where they hang on the stone walls of the Cloisters. On this last visit, however, I deciphered another layer in the familiar unicorn allegory that has piqued my interest. 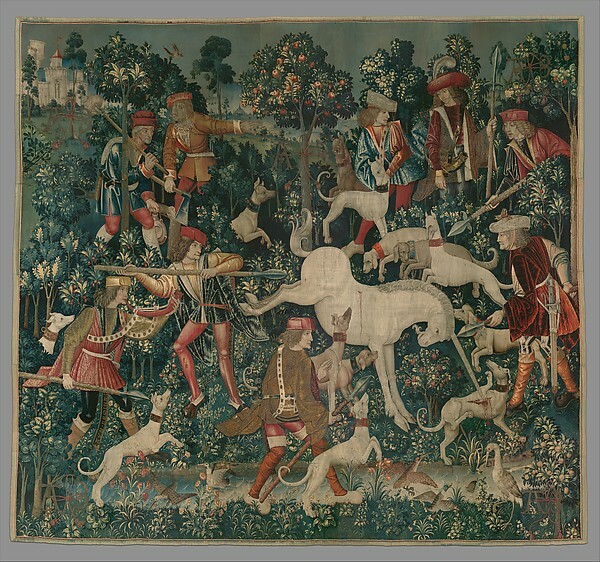 The tapestries–actually entitled “The Hunt of the Unicorn”–depict a common piece of folklore: the hunting of the elusive and desirable unicorn. It is sought, captured, and eventually killed by hunters, who want to despoil it of its horn (thought to have healing and purifying properties). But, true to unicorn mythology, the beast cannot be captured by mere violence; it must be lured and beguiled by the purest of virgins, who is able to tame and capture it so that the hunters can accomplish their task. This panel, unfortunately enough, is mostly obliterated and torn in two pieces (here and here). 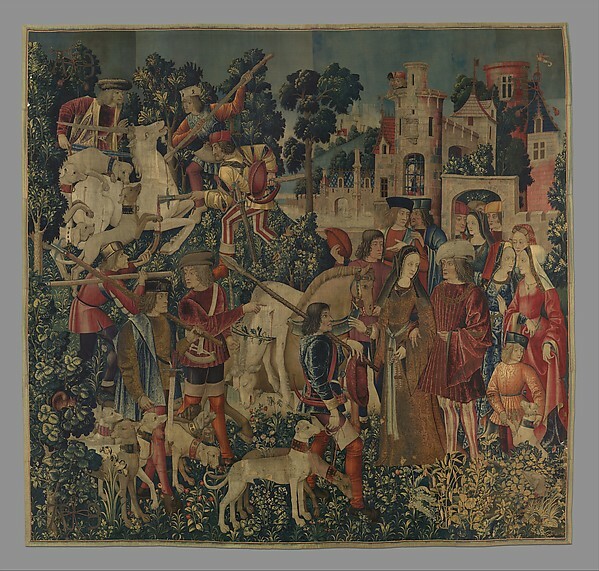 Although the hunters eventually kill the unicorn and carry their quarry to the castle, the last panel in the series shows the unicorn enclosed in a garden (the image above), alive again, but conquered. Beneath this narrative are two historically accepted allegories: a courtly love story (a man is enthralled by his lady love); and a religious allegory (godly Christ becomes vulnerable/is made human through his birth to the virgin Mary, is crucified, and and rises again). But this time around, one of the panels got me thinking about another allegory that lies at the heart of these tapestries and at the heart of unicorn mythology in general. Maybe I just have my feminist goggles on lately, but these tapestries suddenly seem to me to be a sad and beautiful allegory about the treatment of women in society, and about dominance and exploitation in general. Let’s lay aside our cultural prejudice against unicorns for a minute and take a look at these tapestries. The unicorn is not necessarily a feminine symbol (after all, we can’t completely overlook the shape of the horn on its head), but the narrative that surrounds it suggests its role in society is comparable to that of women. Here we have this untamable, autonomous beast, unable to be subdued by force alone; yet its role within the human society around it is one of an object to be exploited. Its horn, presumed to have magical powers, is the object of the storied hunt, pursued by violence and then by guile. The images of attack against this creature are telling, too: in “The Unicorn Defends Itself,” pictured above, the most dominant act of aggression against the animal comes across as sexual in nature, the hunter’s spear poised directly behind the creature’s hindquarters. These hunters are determined not simply to despoil this creature of its horn, but to conquer it, violate it, assert their superiority by taming the untamable. Here we see the unicorn tamed by a virgin (only her left arm and hand on his mane are visible) and her accomplice within the type of walled garden that we often see in medieval art. This sort of garden–the hortus conclusus–was popular from Biblical times through the Middle Ages, and was the particular realm of court ladies, whose chastity was strictly monitored in order to ensure pure bloodlines in noble families. They came to be associated with the Virgin Mary through a verse in the Song of Songs: “A garden enclosed is my sister, my spouse; a spring shut up, a fountain sealed.” (4:12) Mary was often seen as this “fountain sealed,” on account of her perpetual virginity, and this gave the hortus conclusus an air of piety and chastity. In some castles, the hortus conclusus was the only place a woman was allowed to go out-of-doors, and in courtly love poetry, there are definitely sexual implications in the idea of a lover “climbing the trellis”–breaching the walls–in order to reach his lady love. It is no wonder then, that the ladies in this tapestry are safely enclosed in their castle garden, where they lure and betray the unicorn to the hunters without. The fence that surrounds them is teeming with red and white roses which, according to traditional allegory, are associated with the purity (white) and charity/compassion (red) of the Virgin Mary. I prefer to read these flowers with the more usual symbolism of the red rose, which is that of romantic love or even, according to Kate Greenaway, shame. Here we have, not necessarily the virtues of the Virgin, but more likely a duality between the ideal of womanly value (purity), and the reality of human life (love, marriage). Mixed up with this is a healthy dose of shame, present when this reality does not match up with the perceived ideal. In a feminist reading of this series, these beguiling virgins could be seen as having made a patriarchal bargain with the hunters (patriarchy) without; they have bought into a system that harms themselves and their kind, for personal gain (perhaps they will become purer, i.e. more desirable, on acquiring the horn? or perhaps merely prestige in court for their part in the hunt?). They are not wearing the traditional blue and white of virginity, but rather red, carrying similar connotations to those of the red roses around them. This tapestry is the real hinge of the allegory: in the story of courtly love, we have here the image of the conquered bridegroom, chained to the pomegranate tree of fidelity and matrimony; in the Christian allegory, this is Christ resurrected after death. However, I see here an image of the vanquished feminine. The unicorn here is chained to the pomegranate tree (marriage, “fruitfulness,” i.e. virility), the fruit of which is so abundant and ripe that the juice from the seeds is dripping onto the whiteness of the animal, mimicking bloodstains. There is even one suggestively placed stain just beneath the animal’s tail. The flower imagery is significant here, as well, (more fully examined on this interactive page) and mostly comprises of contradictory emblems of purity and fruitfulness, as well as a large number of herbs that supposedly caused women to conceive male heirs. And of course, our unicorn is once again within the confining walls of the ever-present hortus conclusus–subjugated. I am not suggesting that the designers of these incredible tapestries ever intended them to be a subversive message to future generations about the perils of patriarchy. But I think that, to the modern viewer, these symbols are potent enough for us to read another layer of allegory into the story of the unicorn. For me, this allegory confronts the subjugation and exploitation of women, but it could just as easily represent the struggles of subjugated peoples, or even the exploitation of the natural world (unicorn as endangered species?). Reading these tapestries in this light has also made me rethink society’s and my own prejudice against unicorns, and how we have come to understand their symbolism. Maybe they are clichéd and laughable to our modern sensibilities, but they still carry the burden of symbolism: they are still associated with young women, still associated with innocence or naiveté, still satirized and victimized by an exploitative public. As a society, we are still hostile and victimizing to women; we take young women little more seriously than the unicorns we associate them with. We are more hostile than the Middle Ages were to innocence or naiveté in adults, which we now associate with closed-mindedness, gullibility, or even stupidity. (Personally, I rather think these virtues seem more relevant to wonder and curiosity.) And our societal “system” still exerts considerable power in disadvantaging and exploiting those belonging to these parties. Our cultural scoffing at the unicorn is, I think, reflective of our cultural scoffing at what it represents historically and symbolically. Thankfully, this intriguing beast left a different cultural legacy, before it acquired the associations with which it is laden. As an element in medieval art and mythology, the unicorn is something we throng to glimpse; after all, these tapestries are still the Cloisters’ most famous and beloved artifacts. After 500 years, they are admired for their beauty and their mysterious legacy, and critics and historians–as well as pseudo-critics and -historians, like myself) are still drawn to and puzzled by their narrative, allegory, and symbolism. The unicorn, after having been persecuted and exploited within the world within the tapestries, has now been accorded some of the reverence we should have shown it all along. Oh my god, I’m telling everyone I can about this post! Loved it so much, for personal reasons (as I’m sure you can guess), and also because I love unicorns and feminism. So yes, well done!!! 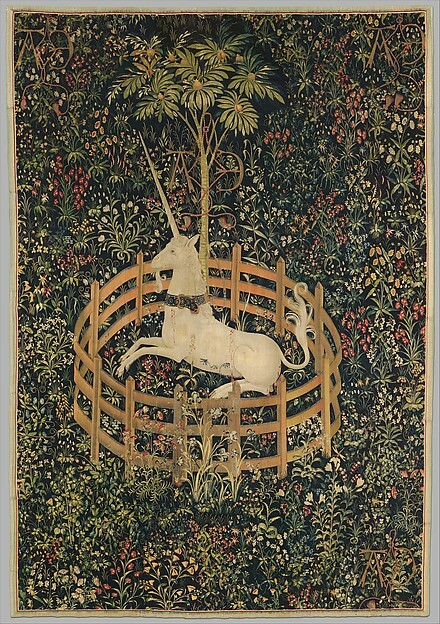 Also, the tapestries are soo gorgeous, particularly “The Unicorn in Captivity.” I’d love a print of that.